ASP.NET MVC 5 Hosting - HostForLIFE.eu :: How To Create Dropdown Menu? In this article, I will explain about how to implement Dropdown list in ASP.NET MVC. In traditional ASP.NET it is very easy to implement just by drag and dropping where we want. 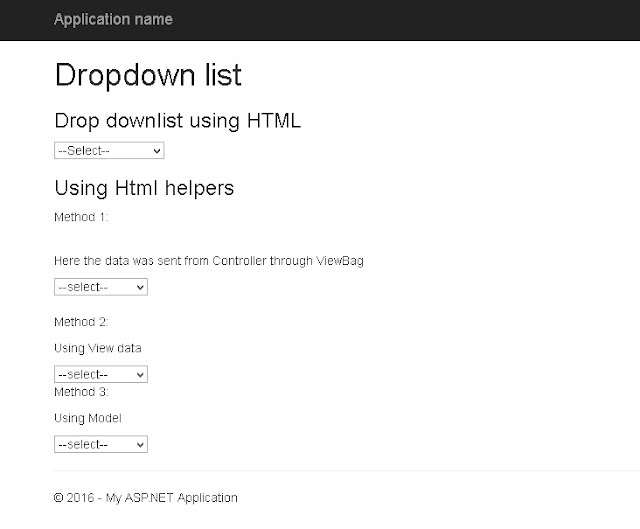 But in MVC we need some attention to create Drop Downlist.We have Dropdown list Html helper in ASP.NET MVC but we need to know how to bind data to Dropdown list Html helpers. we can implement Drop down list in ASP.NET MVC in 2 ways. It is very easy to implement dropdownlist using normal html tags. But, if you want to bind data dynamically to the HTML tags it becomes complicated.To overcome and to make it easy to bind data to Html controls Microsoft introduced HTML helpers Methods.Here we are using Dropdown HTML helper to bind object data to Dropdownlist. 1.It is also easy to implement. Note:In method 1 i am sending data from controller using ViewBag. Model binding.In this method we are binding the data using Model.This method mainly used for Strongly typed Views. 1.First create a model class with the 2 properties. one for Dropdown values and another for storing the selected value. Note: We can also bind the dropdownlist data using ENUM's and arrays also.But, above are the most reliable and used by many developers (in our company also developers uses this methods only.). Finally i got output like this. Could not load file or assembly ‘Microsoft.Web.Infrastructure, Version=1.0.0.0, Culture=neutral, PublicKeyToken=31bf3856ad364e35′ or one of its dependencies. The system cannot find the file specified. The system libraries are installed with .NET 4, however, 'Microsoft.Web.Infrastructure.dll' is only installed when Visual Studio is installed on the machine. Therefore, short of needing to install MVC and Visual Studio on a production environment, we need to deploy the libraries with out application - and we'd like to do so automatically. You will see the following messages if it is successfully installed. Successfully added 'Microsoft.Web.Infrastructure 1.0.0.0' to Web. 3. If you look at the properties of this reference you will notice that “Copy Local” has been set to “True” by default. 4. Now when you “Publish ” your project, Microsoft.Web.Infrastructure.dll will be deployed.